India Post has yet again proved its efficiency by helping people beyond borders via Twitter Seva. Numerous tweets regarding International Parcel Service of the department are received and resolved via Twitter Seva. Twitterati tweets for timely delivery of their articles and express their happiness when their articles are delivered. Similarly Lubha Siddiqui tweeted “@ IndiaPostOffice which is an international pre paid parcel from Hong Kong, which was to be delivered to my address at Lucknow”. The article was delivered the next day and she tweeted her gratitude. India post receives grievances regarding delivery of foreign articles which are resolved earnestly. India Post has proved that it has no borders, no limits and no frontier to help people across the globe. Minister of Communications Shri Manoj Sinha launched “Twitter Seva” for addressing the complaints and concerns of common man and other stake-holders in the telecom and postal sectors in August, last year. The Telecom Ministry and the Department of Post compile a list of complaints from the Twitter Seva @manojsinhabjp and the departmental twitter accounts and categorize them into immediate, mid-term and long-term complaints for redressal. The TSPs (telecom service providers) are expected to resolve the complaints forwarded to them under this arrangement. India Post had handled more than 32,000 tweets and recorded 100% resolution till date. The citizens have taken to the platform and their confidence in quick redressal of their grievance is growing by each passing day. They are appreciating India Post over Private Couriers for its quality and fast delivery and that too at a low cost. Similarly, the concerns of the customers are promptly addressed by providing them with information on the delivery of their articles containing PAN Cards, Roll numbers, medicines etc. Issues relating to repairs of Post Office buildings, technical issues with saving banks accounts are also sorted out quickly. India Post resolves complaints beyond borders via Twitter Seva - Recorded 100% resolution India Post has yet again proved its efficiency by helping people beyond borders via Twitter Seva. 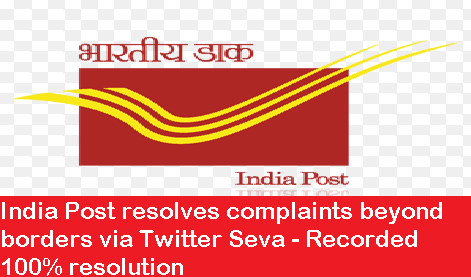 Numerous tweets regarding International Parcel Service of the department are received and resolved via Twitter Seva. Twitterati tweets for timely delivery of their articles and express their happiness when their articles are delivered.